At the last Republican primary debate, Marco Rubio's answer on Cuba earned the freshman senator a standing ovation from the Miami audience. It happened just moments after Donald Trump's answer on the same topic was greeted with muffled laughter, so this may have been one of the few moments where Rubio managed to outdo Trump at a debate. It's not going to win Rubio the nomination, but hey, he may as well get some punches in before his inevitable withdrawal from the race. Trump was asked whether he'd continue or end diplomatic relations with Cuba if elected president. Trump's answer, not surprisingly, was that he'd put off diplomatic relations until "a really good deal was made" between the two countries. Equally unsurprisingly, Trump didn't specify what a "really good deal" would look like. But Rubio, who'd been waiting his entire career to deliver a stemwinder like this on Cuba, certainly did. "I know what the good deal is," Rubio said. "Cuba has free elections. Cuba stops putting people in jail for speaking out. Cuba has freedom of the press. Cuba kicks out the Russians from Lourdes and kicks out this Chinese listening station in Bejucal. Cuba stops helping North Korea evade U.N. sanctions. Cuba takes all of those fugitives of American justice, including that cop-killer, and send her back to the United States and to jail where she belongs, and you know what? Then we can have a relationship with Cuba." The crowd loved it, and for Rubio, the timing was perfect. Thursday's debate took place in Florida, which A) is Rubio's home state, B) votes in a week, and C) has a whole lot of Cuban refugees who vote Republican and really, really hate the current regime in Cuba. 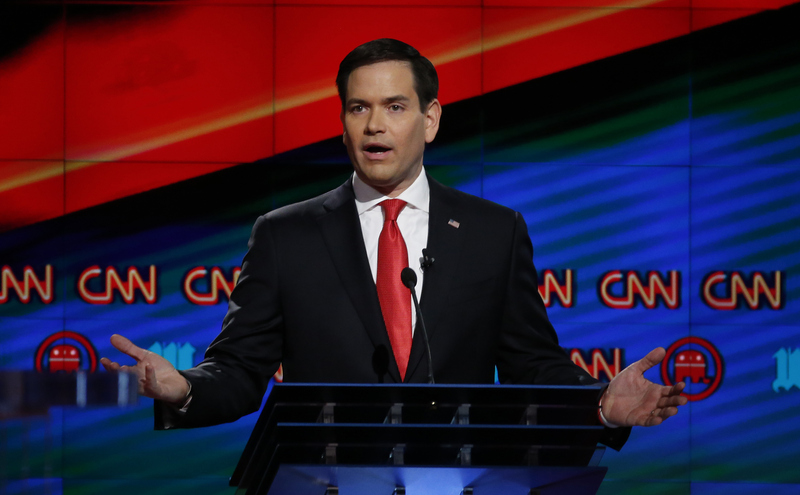 If Rubio's tirade against Cuba was ever going to have an impact, it would have been on that stage during that debate. But it probably won't. The fact is that Rubio is still far behind in delegates. He's still only won a single state, and he's still trailing badly in Florida. Barring a miracle, he won't win the Republican nomination — but hey, a good speech is still a good speech.